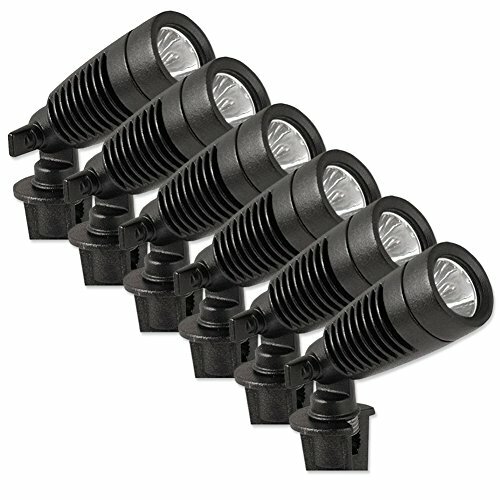 Moonrays 95535 LED Outdoor Landscape Metal Spot Light Fixture, 6-Pack, Black, 1-Watt. About 10 Inch tall. 1-watt LED bulb with 100,000 hour life expectancy. Use lights in your low voltage lighting system. Warm white LED light shines a spot on your target wall or garden accent. This bullet spot light is common in gardens, using little electricity and creating accent light. If you have any questions about this product by Moonrays, contact us by completing and submitting the form below. If you are looking for a specif part number, please include it with your message.